Chic cyclists abandon spandex for colourful frocks and vintage-wear, joining the worldwide Pretty Riding movement. When an SUV pulls up inches from her handlebars, Rachael Craig's heart races. The Halifax cyclist says drivers often have road rage. "It's very scary," she says. "I don't want to feel that my life is threatened to get to school or to get to the grocery store." "You're really vulnerable on your bike," her friend Hayley Gray adds, pointing to last summer's naked bike ride as a show of vulnerability. "You're not trying to be some little punk or get in someone's way; you're just trying to get from point A to B like everyone else." To diffuse the tension, Craig and Gray began decorating their bikes and dressing creatively. Enter the concept of Riding Pretty. Craig pedals down Quinpool on a purple cruiser from the Halifax Cycle Gallery. Her locally made dress flutters in the breeze. Gray glides behind her wearing a turquoise pashmina, black dress and pink flats. The pair's philosophy combines elements of fashion and environmentalism into one package. Riding Pretty combats road rage and promotes community by making cyclists more visible and approachable. It supports local bike shops, boutiques and designers. So far they have an informal following of stylish Haligonian bikers. The idea occurred to them simultaneously, as these things often do for like-minded fashionistas, when they spotted a friend in a pink dress perched on her bike in front of the Paragon with flowers in her hair. Soon they noticed other women and men commuting to work or play in fashionable attire. This new---but rare---breed of cyclist contrasts the sweaty, spandex vision of athletic bikers who for so long have been the norm. The two agree Haligonians have an approachable, individual sense of fashion that's sometimes lacking in bigger cities. "I feel like we're stylish as opposed to fashionable," Gray says. "We have a much more creative, community-type of style," Craig adds. "I just go to Toronto and everyone's wearing black, they don't look happy, they don't talk to each other...People tell me my pretty colours remind them of Halifax." In large international cities such as London, Tweed Biking---pretty biking in another form---has dedicated followers. 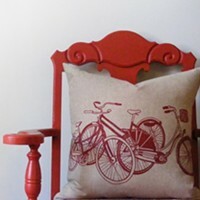 Blogs such as ridingpretty.blogspot.com combine bikes and fashion into one sartorial focus. Bikers in street style photos demand attention with creative cuts and colours. Like them, Craig wears red lipstick, black heels and a tweed helmet that mimics a hat. "Fashion as a hierarchal class structure is dead in so many ways," she says. "It's moving to people dressing how they want to dress. You can buy $100 pants that are for yoga, or you can buy $2 dresses that are fabulous." Pretty bikers don't need expensive clothes, fancy bikes or female anatomies. They should be dressed creatively and be ready to ride with a group. Local, second-hand or clothes-swapped garments are encouraged, as are vintage, decorated or do-it-yourself bikes. Pair that vintage lace dress with your most comfortable red heels, throw a water bottle in your purse and meet Craig and Gray at Victoria Park on Friday, May 28 at 6pm for Critical Mass. The pretty biking pair will also host high tea, picnics, bicycle decorating parties and other events in the summer months to come. "Hopefully people will be less angry," Gray says. "And realize that we're traffic on the road," Craig adds.